The process is as easy as one-two-three. Just click to buy and checkout through our safe and secure shopping cart. No additional out of pocket expenses. We ship a kit to you with everything you need from the molding trays and putty to the prepaid packaging if you need to return it to us. After we receive your dental impression, we get right to work crafting a stone mold of your teeth. Once we have a stone casting of your teeth and gum line we create the perfect custom fit mouth guard. Guaranteed. "This team really does go to great lengths to meet customer satisfaction. I messed up my first dental impression and was quickly shipped another for free. Then wanted to change types after I received my soft night guard. They upgraded me and I just had to pay the difference in price. Way more flexible than my money hungry dentist! Great customer service." "I never write these things because I never really care to, but Sentinel really hooked me up. They were really nice on the phone and helped me through the whole process of picking the right guard, shipping, taking my own impression etc. I choose the .40 because I wanted strength but wanted to keep it thin in my mouth since I’m a light sleeper. This company is very professional, thanks for everything." "This is the best nightguard I have ever owned–better than those I paid $500+ for at the dentist’s. It’s thinner than I am used to which initially concerned me, but the material is extremely strong and durable, so the thinness ends up being a positive because it makes the nightguard less obtrusive and more comfortable." 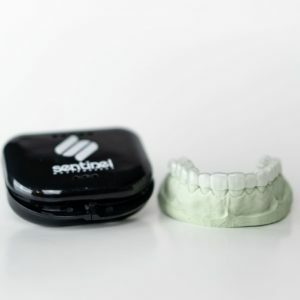 "I LOVE Sentinel mouth guards! I’ve been ordering from this company for at least 5-6 years. Always quality products, wonderful service, and especially unbelievably great prices! Don’t pay the dentists’ high prices – buy from Sentinel and save money for the exact same thing your dentist makes – at a fraction of the cost!" 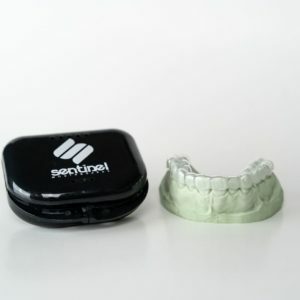 A Great Fitting Dental Night Guard for Teeth Grinding Minus the High Price Tag. Dental offices are charging anywhere from $500-$1500 for the exact same custom made dental appliances we are able to offer you at lab direct cost. With a combined 30 years experience in the night guard industry, our dental lab technicians are trained extensively in safe and proper night guard fabrication. Our game is mouthguards and our team is lean and efficient. By cutting out the high costs of the dental assistants, offices and insurance companies, we eliminate all the middlemen and deliver the same high-quality product directly to the customer. Since we specialize in mouth guards and night guards without all the other dentist office expenses, we are able to use the highest quality materials, state of the art pressure forming machinery, trained technicians to deliver the highest quality product at a fraction of the cost. A custom night guard will protect your teeth from each other. Nocturnal teeth grinding and jaw clenching are involuntary actions with no known medical cure. The most effective way to prevent damage is to simply wear a mouthguard. The dental night guard creates a space between your upper arch and lower arch so there is no direct tooth to tooth contact. 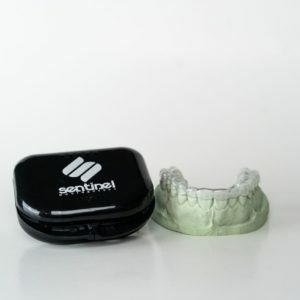 This protective case for your teeth can save you thousands of dollars in teeth repair bills down the road and a bonus, it fits like a glove! We know the struggles and outright avoidance of a dental night guard because it’s uncomfortable. It can get in the way of sleep and sometimes hamper breathing. Even a custom dental night guard can put stress on your jaw if it doesn’t fit perfectly. Upon receiving your home dental impression, we need 8-12 business days of lab time. Once completed you will receive an email with USPS tracking info at time of shipment. We mail packages using USPS First Class Mail, but an expedited service option is available. For an additional $75, we guarantee a 2 business day lab turnaround time and includes USPS Priority shipping. Grinding and/or clenching your teeth together may not seem like a big deal at first, but the constant action over time will create multiple dental issues including abrasions, abfractions, broken teeth ranging from hairline fractures to severe breaks, and thinning of the enamel. The “fix” for these dental issues can be costly to say the least. For example, on average, one root canal on one tooth costs anywhere between $800-$1500. That’s just one tooth! There is no known cure for teeth grinding. 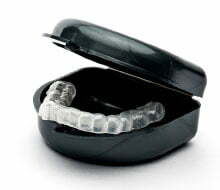 Wearing a dental night guard is the only proven, effective way to prevent further damage. The fit of the night guard is just as important as your decision to wear one. Simply put, if the night guard is uncomfortable, you’re not going to wear it. 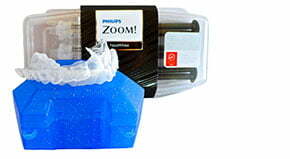 A custom dental night guard is made from a mold of your teeth using the best quality material. With store bought guards like the boil and bite kits, the sizing is limited and any modification can jeopardize protection. Most importantly, you can lose up to 70% of the protection after the boiling process. 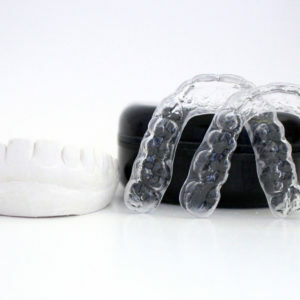 All Sentinel custom fit guards are individually made from the impressions of your teeth. Follow the simple directions with our send home kit, and your mouthguard will be snug and comfortable. A good impression should include all your teeth and extend to the gum tissue above the teeth. This is why you should avoid store bought, mass produced night guards. If the appliance is not made for your unique dental anatomy, it is going to position your bite unnaturally and this can cause stress on the jaw joints which can lead to many other issues including bite misalignment and even inflammation.